Your builder is required to sign a contract with the Gowrie Farm Homeowner’s Association prior to commencing construction on the property. This will be arranged at the site handover meeting. 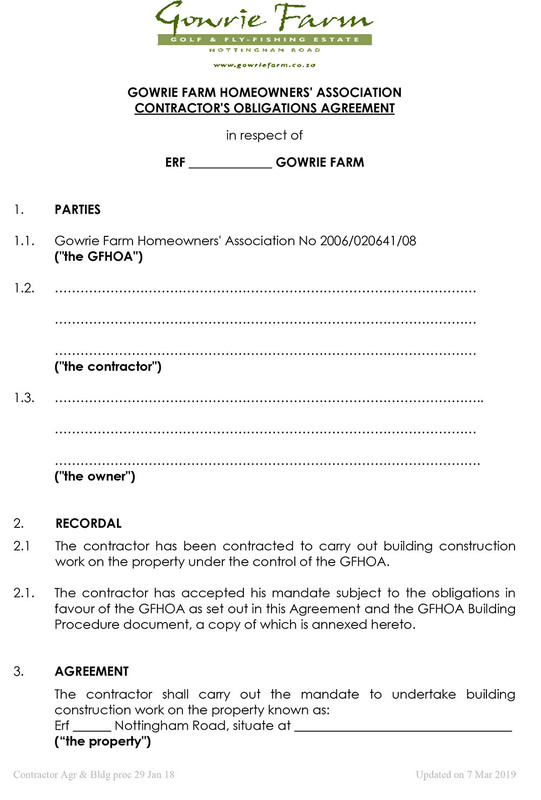 The contract regulates how the contractor and his staff are required to conduct themselves while building on site at Gowrie Farm. The building contractor will be required to lodge a deposit with the Gowrie Farm Homeowners’ Association prior to commencing building on any erf at Gowrie Farm. If an owner retains the services of his architect to inspect the building process on a regular basis, the deposit required will be R10 000.00. If an owner does not retain the services of his architect for on-site inspections, the deposit required will be R20 000.00. This deposit is to be lodged with Venn Nemeth and Hart. For further details, view the Building Code & Procedures.